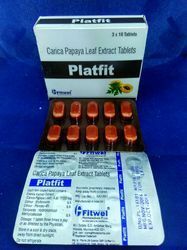 We are leading suppliers of Platfit Tablet. It is composed of Carica Papaya. - Uses : Papain: 1. It regulates the expression of replicase polyproteins. 2. It is a strong digestive Extract. 1) PRODUCT NAME = INCREPLAT CAPSULES. 2) COMPOSITION = CARICA PAPAYA + TINOSPORA CORDIFOLIA. Backed by our expert and experienced professionals, we provide Cariset Papaya Extract Tablets.